The grapefruit is a fruit with a spherical shape, slightly flattened, with a pale yellow or reddish smooth or rough skin. It is consumed mainly as fresh fruit, and has numerous digestive, stomach and antiseptic qualities. The grapefruit prevents cardiovascular diseases, fortifies the immunological system, prevents colds, stabilizes the intestinal flora, activates the metabolism and the cellular growth and contributes to the loss of weight. 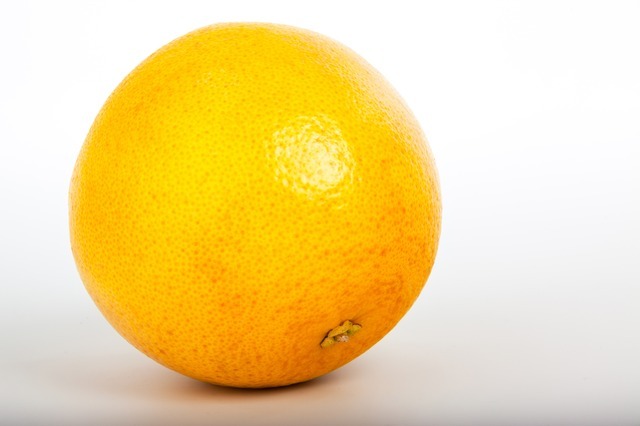 The grapefruit has a slightly flattened spherical shape, with a of smooth or rough, thick skin of a pale greenish colour, that turns into yellow when it matures. It has a bitter flavour. The pulp is divided in 10-12 gores that have also a bitter taste, due to the so-called naringin substance. The flesh is yellow except in the reddish varieties, that range from pink to red and have a sweeter taste. Its English name, Grapefruit, makes reference to the fact that the fruits grow in clusters. It is consumed as fresh fruit; at an industrial level, the juice is the only use. It is also used in the kitchen as a garnish for meat such as duck, chicken, pork or even prawns. There is a big misunderstanding between the grapefruit and the citron fruit. It is a common error, many people think that they are the same fruit. In fact, the citron fruit, Citrus Grandis, is a citric fruit different from the grapefruit, cultivated exclusively in tropical climates and almost with no importance in the world commerce. In the Northern Hemisphere, it is commercialized at the beginning of winter and lasts until May or June thanks to its good preservation in cold storage rooms. It is, as all the other citrus, very rich in vitamin C. It has many healing properties, such as the prevention of certain types of cancer, and digestive, stomach, antiseptic, tonic and diuretic qualities. The grapefruit grows in leafy trees which are sensible to cold weather and demand heat to bear quality fruit, which grow forming clusters. The grapefruit, Citrus paradisi, is a spherical fruit, around 15 cm of diameter, smooth or rough, thick, resistant skin, green coloured, that turns into intense bright yellow when it ripens. As it happens with oranges, the grapefruit pulp contains quite a lot of juice, it is seedless or almost seedless, divided in ten or twelve gores, with a slightly bitter flavour and used mainly as a drink. Grapefruits grow in great habit trees, with a thick thorny foliage and a perennial leaf. The flowers are great and white. They are more sensible to cold weather than oranges and more demanding in heat in order to bear quality fruit. For that reason, grapefruits from tropical areas such as Florida in E.E.U.U or Cuba are highly appreciated.